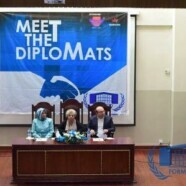 Meet the Diplomats had some esteemed panelists in session. 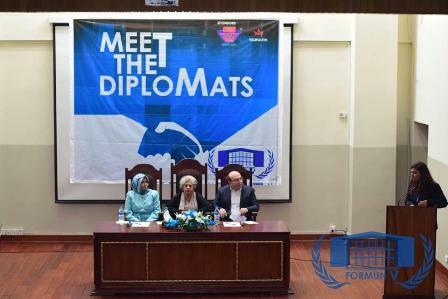 The first guest was Chairman Rumi Forum, Mr Mesut Kacmaz, the second guest was Mrs Meral Kacmaz, Director Women’s Platform at Rumi Forum followed by Her Excellency Syeda Abida Hussain, a veteran politician and former ambassador of Pakistan to USA. Their speeches were followed by a question and answer session in which the delegates asked some well-articulated questions. Even though all speakers had a different story to tell about their profession and the struggles of their life, the theme of their stories coincided with each other’s. Most definitely, all people who left that room by the end of it must have integrated great lessons of diplomacy and global peace-keeping.